Be careful when you buy a bush rose, that is, a hybrid tea, a grandiflora or a floribunda rose (as opposed to a shrub rose). The label is not telling the truth about the plant’s hardiness: it’s a sort of horticultural little white lie. 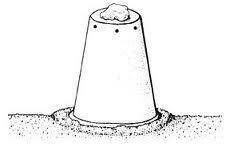 And if you don’t know this, you can find yourself, horticulturally speaking, screwed. You’ll find these roses labelled as being adapted to hardiness zone 5, or maybe even hardiness zone 4, which seems to make them great choices for the northern half of the US and also southern Canada. In actual fact, though, they are no where near hardy in either zone, but most likely only to zone 7 or even 8. In other words, forget their surviving in Boston or Minneapolis: they’ll freeze to death in the winter in most areas north of the Mason-Dixon line. Why this blatant lie? Winter protection is required for most bush roses. It occurs because nurseries assume you already know these roses are not hardy enough to survive on their own, that you are aware they need protection in almost any climate where prolonged winter temperatures below freezing are expected. Their zone 5 or zone 4 label is meant to give you an idea of what the plants can take if they are carefully protected for the winter. You’re expected to know that means, for example, abundant mounding if you garden in zone 6, a rose cone filled with mulch in zone 5 or even digging a trench and burying the plant for the winter if you’re in zone 4. And the same nurserymen assumes you know that a hard winter will probably kill these roses even with a good protection. Yes, they’re really that tender! But this isn’t the 1950s when the average family had just moved from the farm to a suburban lot and brought lots of gardening experience with them. Those new suburban gardeners knew roses needed protection, plus they expected gardening to be hard work (that sort of a negative attitude towards gardening is slowly dissipating today), so didn’t think twice about the added trouble of plants needing winter protection. Some 60 years later, that old gardening knowledge has often been lost. Yes, more people today are trying gardening than ever before, but many new gardeners never saw their parents or even grandparents garden. The whole thing is totally new to them. How are they supposed to guess that a zone 5 label means a plant is hardy in zone 5… unless it’s a bush rose? Even if you told them, it seems so ridiculous they probably wouldn’t believe you. Bush rose killed by the cold. 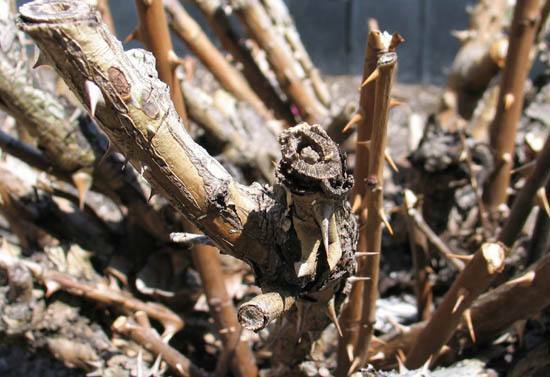 How many gardeners in colder climates lose their not-really-zone-5 bush roses each winter? I’ll bet that at least half are toast by spring. It’s unfair to expect beginning gardeners to know that, when it comes to bush roses and only bush roses, zone 5 really means zone 8. 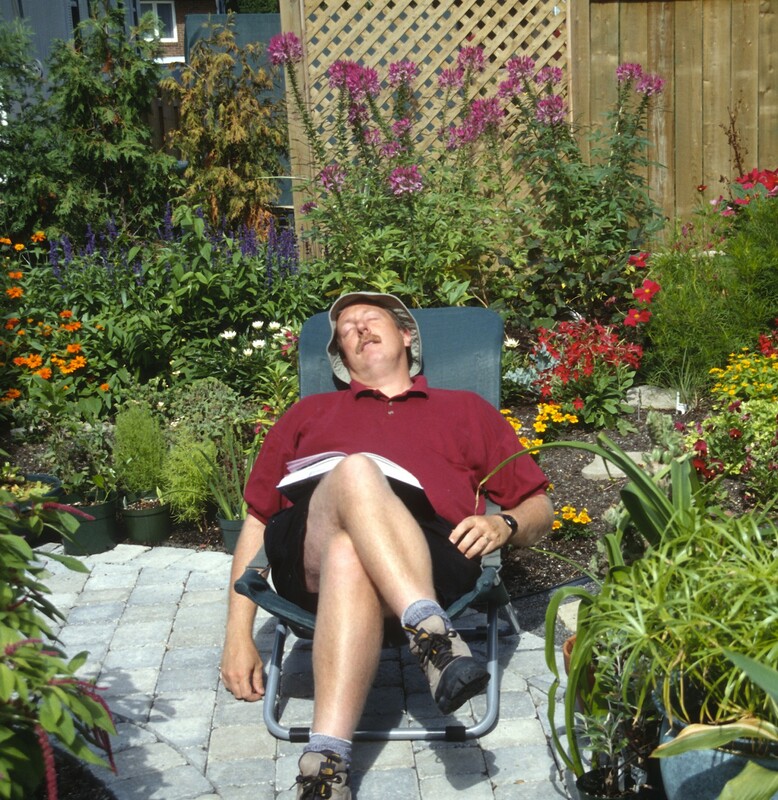 Yet if they have a bad experience gardening, they may gave up a hobby that should be fascinating, healthy and fun. And that’s unfortunate for the gardening world… and the nursery with the lying label loses a client. Ideally, the hardiness zone given for any plant ought to be its real one. Of course, I fully understand the dilemma of a nursery owner: if he gives “zone 8” as the hardiness zone for a hybrid tea rose, he’ll scare away any gardeners from zone 7 down. I therefore suggest the following compromise. Why not label the plant as “zone 5 with winter protection”? That would make things much clearer. Even a beginner gardener would certainly understand he or she needs to do something to protect the plant from the cold and would, with luck, get information on how to do it from the garden center selling the plant. Hardy shrub rose ‘Winnipeg Parks’, zone 2. 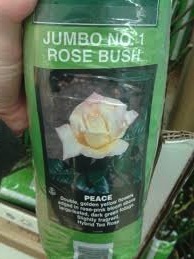 Oddly, the same nurseries that lie about the hardiness of bush roses tell the truth about shrub roses! These roses are bigger, fuller plants and most are naturally more cold resistant (hardy) than the bush rose trio: hybrid teas, grandifloras and floribundas. Nurseries proudly list their true hardiness zone on the label: 2, 3, 4 or 5, depending on the cultivar. No winter protection is needed for these hardy roses as long as you plant them in their proper zone, or a warmer one. Thus, a shrub rose labelled “zone 2” can be grown in zone 2, but also in zones 3, 4, 5, 6, 7, 8 and 9 (most roses have a hard time with tropical climates: zones 10 and above). 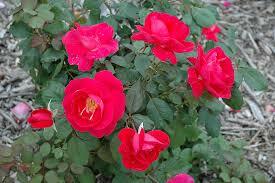 And a shrub rose bearing a “zone 5” label will grow, without protection, in zones 5, 6, 7, 8 and 9. As a laidback gardener, I strongly encourage northern gardeners at least to prefer hardy shrub roses to frost susceptible hybrid teas, grandifloras, and floribundas. 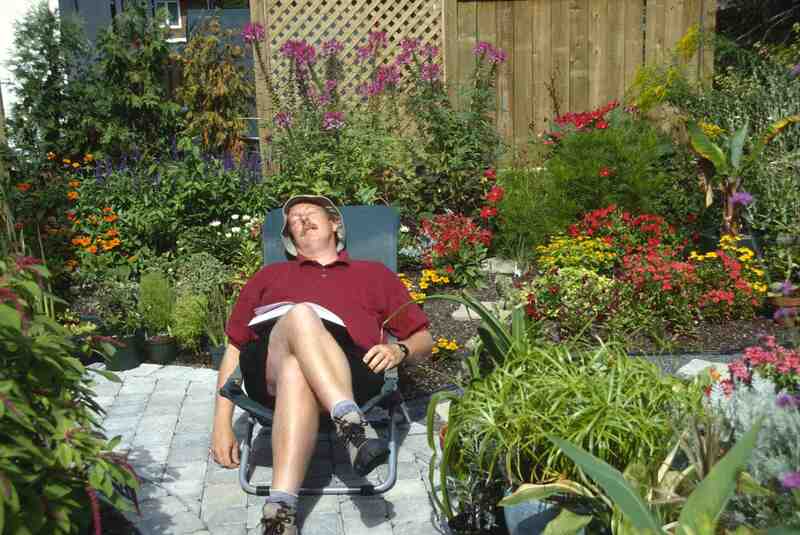 After all, one of the basic principles of laidback gardening is to stick to plants adapted to your climate. Not needing to protect a plant for the winter means less work not only in the autumn, when you cover or bury the plant, but also in spring when you remove the protection. So go with shrub roses: they’re much easier to grow!